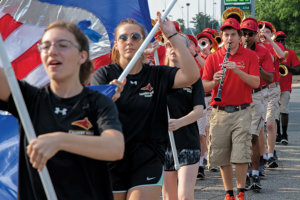 July included Wednesday night practices – with the exception of the Fourth of July, when they marched in the Dundalk and Towson parades. 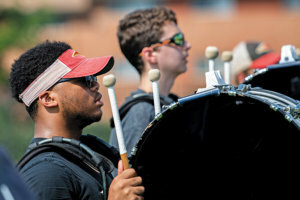 Daylong band camp began Aug. 7. The Cardinals’ full marching band numbers nearly 150 students. From them, approximately 60 perform as a competitive group five or six times over the autumn and winter. The effort pays off, as Calvert Hall has been recognized as a national champion from USBands and the grand champion of the 2016 Allstate Sugar Bowl in New Orleans. 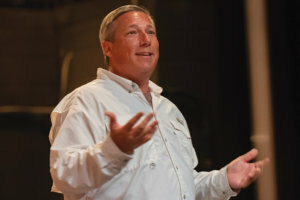 While Calvert Hall’s music program includes 13 performing ensembles, five levels of music theory and as many as six electives, Ecton lets freshman parents know that forming musicians is not his top priority. In the fall, the competitive marching band practices Tuesdays, Wednesdays and Thursdays, 3:30-5:30 p.m. Despite the demands, Ecton said, members are high academic achievers. Entering his junior year and first year as drum major, Riley Cox will keep time and help others with their music and field placements as he conducts both the competitive and noncompetitive marching bands. “It’s great to help kids develop themselves, especially when it comes to something as intense as this,” he said. A trumpeter since fourth grade, Cox said that marching band is a complex extracurricular endeavor, mixing athleticism and music. August practice included 100-degree heat, sometimes in long-sleeved shirts and pants, with some carrying tubas and bass drums. The schedule for the 2018-19 year includes a trip to perform at Disney World, a Calvert Hall rite of passage done once every four years, with a smaller trip, in recent years a college football bowl game, in between. Funding a premier marching band includes an annual Car and Craft Show (Oct. 13), a spring Jazz Dinner and smaller fundraisers. Ecton estimates that 70 percent of all costs are out-of-pocket for families. For parents, road trips mean long days, getting instruments on and off the field, and preparing lunches and snack bags. Seven of the eight color guard members are female students mostly from Maryvale Preparatory School in Lutherville, Mercy High School in Baltimore and Notre Dame Preparatory in Towson. Some learned about the group from Calvert Hall brothers, and others from school organizations. Calvert Hall junior Joseph McHugh used to march in the band, but switched to color guard when he wanted a new challenge. Many of the color guard have backgrounds in dance, cheerleading, gymnastics and martial arts. The band performs the same show during a competitive season, making adjustments as needed. He formerly wrote both the music and the drill for the show. Now, due to time restraints, he purchases the music. A show consists of 80-100 pages of drill direction, each taking an hour to write. A computer program aids the process, which allows Ecton to incorporate students’ individual abilities. “We’ll have some up years and some down years, talentwise,” Ecton said, noting that the class of 2018 was one of the best. 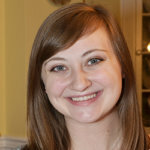 “You get really worried about it … and then you have a freshman class that we just welcomed. Top to bottom it’s the most talented group that we’ve seen.